Producer and Lyricist. Nationality: American. Born: Arthur Grossman in Charleston, South Carolina, 9 September 1894. Military Service: 1917–19—served during World War I as sergeant. Career: Piano player for music publisher, Chicago; later appeared with the Marx Brothers and Gus Edwards in vaudeville; toured in vaudeville, and began writing songs and special material (first hit song, "I Cried for You," 1923); 1924—opened The Orange Grove Theatre, Los Angeles, and presented straight and musical plays; 1929–39—lyricist for MGM; 1939—producer for MGM: in charge of special musical unit; 1963–66—President, Motion Picture Academy. Awards: Irving G. Thalberg Award, 1951; Academy Award for An American in Paris , 1951; Special Academy Award, 1967; Chevalier, Legion of Honor. Died: 12 April 1973. Galling, Dennis, in Films in Review (New York), November 1964, (corrections in December 1964). Fordin, Hugh, in The World of Entertainment: Hollywood's Greatest Musicals , New York, 1975. Craig, Warren, in The Great Songwriters of Hollywood , San Diego, California, 1980. Braudy, Leo, "Film Genre: A Dialogue: The Thirties and Fourties," in Post Script (Commerce), Spring-Summer 1982. National Film Theatre booklet (London), May 1980. Wald, Malvin, "At War with M-G-M," in Creative Screenwriting (Washington, D.C.), Spring 1994. Rimoldi, O.A., "Produced by Aruthur Freed," in Films in Review (New York), July-August 1994; September-October 1994. Restif, Henri, "Fred, Busby, Gene et Arthur," in Avant-Scène du Cinéma (Paris), February 1996. Tinkcom, Matthew, "Working Like a Homosexual: Camp Visual Codes and the Labor of Gay Subjects in the MGM Freed Unit," in Cinema Journal (Austin), Winter 1996. Elley, Derek, "Musicals Great Musicals: The Arthur Freed Unit at MGM," in Variety (New York), 16 December 1996. Few producers have been as closely associated with or as instrumental in the development of a specific film genre as Arthur Freed. Freed's contributions to the Hollywood musical helped shape the look and style that dominated the genre in the 1940s, reaching a peak in the 1950s with such films as Singin' in the Rain , The Band Wagon , and An American in Paris . Working at MGM with a group that included many of the best directors, performers, songwriters, and technicians of the day, he oversaw the production of films which have become classics of the form and his influence is felt in the image which persists of the American musical. Freed's own development as a producer grew naturally out of his early career as a lyricist. Together with his most frequent collaborator, the composer Nacio Herb Brown, Freed wrote dozens of popular songs, including such standards as "Broadway Rhythm," "Singin' in the Rain" and "You Are My Lucky Star," and he continued his work as a songwriter intermittently throughout his years as a producer. It was as a lyricist that Freed had originally come to MGM, but by the late 1930s he had begun urging Louis B. Mayer to allow him to produce, and in 1938 he received his chance when the studio began developing L. Frank Baum's children's fantasy, The Wizard of Oz , for the screen. With Mervyn LeRoy as its producer and Freed as associate producer, the film became one of MGM's most successful features and secured for Freed a far more autonomous position within the studio hierarchy. Freed's particular skill was his ability to recognize exceptional talent in those around him, and he began gathering together a group of individuals whose aptitude in the musical field was second to none. This group became known as the "Freed Unit," and its members included artists and technicians representing all aspects of the process involved in producing musical films. Some worked exclusively for Freed while others made films for outside producers as well, but all did work under the Freed Unit banner that ranks with their best. 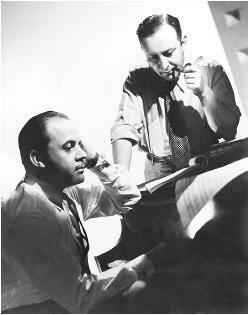 The composer Roger Edens became Freed's trusted colleague and associate producer, while Vincente Minnelli, Stanley Donen, Busby Berkeley, and Charles Walters were among the Unit's leading directors. Freed had been instrumental in signing 13-year-old Judy Garland to a contract with MGM in the mid-1930s, and she became—along with Fred Astaire and Gene Kelly—one of the performers most closely associated with the producer. (Lena Horne and June Allyson were also among those recruited by Freed for the studio.) Cole Porter, Irving Berlin, and Oscar Hammerstein all wrote songs for Freed, and his production staff drew on the finest art directors, costume designers, musicians, and choreographers the industry had to offer. The result of Freed's efforts was the formation of the Hollywood equivalent of a theatrical stock company, with many of the collaborators forming close working relationships which lasted throughout the better part of three decades. The films produced under the aegis of the Freed Unit brought the members of the company together in varying combinations and raised the art of the musical film to new heights. Bright, colorful, and energetic, these films were increasingly characterized by elegantly mounted productions and elaborate musical numbers, the most acclaimed of which was the 20-minute "American in Paris" ballet from the movie of the same name. That film represented the Unit in full flower, however, and Freed's initial efforts were on a somewhat more modest scale. His early films are exemplified by the series of black-and-white, so-called "backyard" musicals he produced starring Judy Garland and Mickey Rooney. The films all follow the same general format: a problem, usually financial, arises in the context of the story's small-town setting and Mickey and Judy solve the crisis by putting on a show in a barn or the high school gym. Garland was also the star of the film which began a transition in the Freed Unit's style— Meet Me in St. Louis . Directed by Vincente Minnelli, the film is a warm, simple family story and a painstakingly recreated period piece, shot in richly evocative color and marked by production values which reflected an increasing confidence on the studio's part in the potential success of Freed's projects. The majority of the Unit's subsequent films were also in color, a development which lent itself splendidly to the patterns of a choreographed dance routine. Minnelli, in particular, translated the changeover from black-and-white into a cinematic style noted for its vivid imagery. Working later with both Gene Kelly ( The Pirate , An American in Paris ) and Fred Astaire ( The Band Wagon ) and backed by Freed and the resources of his production staff, Minnelli created musical numbers that are elaborate yet witty and refined—carefully escalating orchestrations of color, music, and movement that use the screen much as a painter uses a canvas. Freed produced musicals which stretched the genre in other directions as well. In 1949 On the Town became the first musical ever shot on location, as the codirectors Gene Kelly and Stanley Donen staged the film's production numbers on the streets of New York City, an unheard-of idea at that time. The process gave the film a vibrant energy and realism impossible to capture on a studio set, and it remains one of Freed's most innovative and successful projects. The two films which best reflect the Freed Unit's influence on the musical both appeared in the early 1950s— Singin' in the Rain and An American in Paris . Although both star Gene Kelly, they are quite different in style and execution, each in its own way displaying the artistry and breadth of talent characteristic of the films Freed produced. Like On the Town , Singin' in the Rain was co-directed by Kelly and Stanley Donen, and the film tells its behind-the-scenes Hollywood love story with a lively energy that can encompass the extravagant "Broadway Ballet" number, Donald O'Connor's comical "Make 'em Laugh," and Kelly's famous rendition of the film's title song. Boisterous and colorful, Singin' in the Rain is pure entertainment made in the best traditions of Hollywood movie-making. An American in Paris , directed by Vincente Minnelli, cast the ballet-trained Leslie Caron opposite Kelly, and the film is a fusion of varying dance styles and elements of French and American culture. The "American in Paris" ballet takes place on a vast set which recalls the styles of several French Impressionist painters as Kelly and Caron mix classical dance with jazz and a touch of Broadway hoofing in one of the most ambitious musical numbers ever filmed. As its producer, Freed received the film's Academy Award for Best Picture (he would receive his second Oscar for Gigi seven years later). An American in Paris remains an outstanding example of the scope of imagination and talent that marked the work of the Freed Unit. The musicals produced by Arthur Freed reflect the collaboration of an extraordinary group of gifted individuals, all working under the guiding hand of a man whose instincts and taste set the standard for their achievements, and the films themselves are among the best the genre has to offer. Freed's influence in shaping the style of the Hollywood musical during its Golden Age remains unsurpassed and the form continues to bear the stamp of his talents.